'AFFINITY RATED at No 1 with '4 STAR rating' and 'best value for money'. No need to squeeze into a hotel room when you can relax in a oversized condominium with twice the space, more inclusions, higher quality and better value at nearly half the price to other traditional hotels. We offer fully furnished 4 star self catering luxury residences not available anywhere else and affinity is located only a few hundred meters from CLARK AIRPORT maingate. AFFINITY's 4 STAR OFFICIAL RATING is not just our opinion, our services, amendities and in particular each individual unit has been RATED by AGODA. As well, AFFINITY is rated No 1 for best value out of all hotels and resorts in the 4 star categpry by AGODA themselves and by other online booking companies. AFFINITY prices also compete with any of the 3 star hotels located in Angeles City making Affinity your number 1 choice everytime. 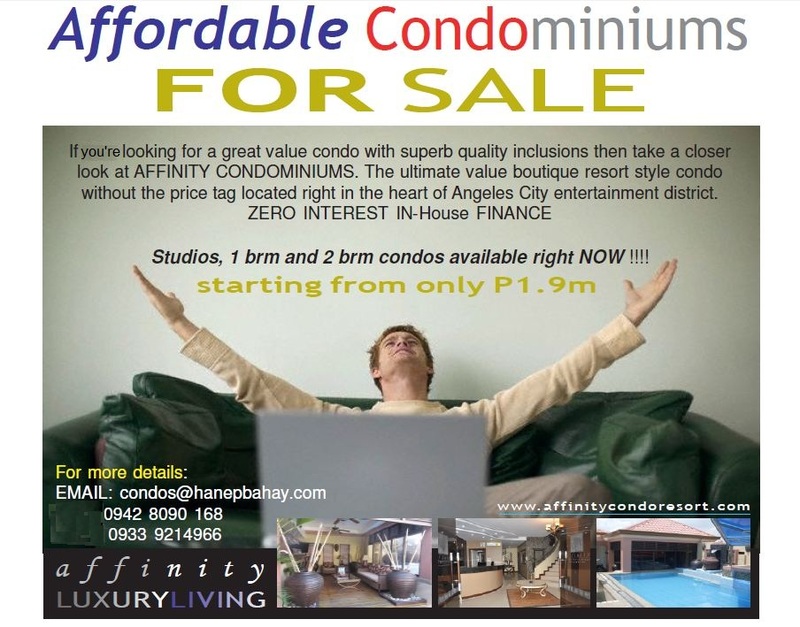 Statistically, the reality is AFFINITY is by far the lowest priced 'best value' accommodation option with the best internal living spaces in ANGELES CITY or for that matter in the Philippines if you consider our customer opinion and feedback. AGODA's official site publishes AFFINITY with a 4 STAR RATING and AGODA RANKS AFFINITY more often than not at No 1 or if not in the top 3. www.agoda.com. Feel at home with your own kitchen, dining room, separate bedrooms, built-in-robes, linen cupboards and low cost laundry facility. We offer fully furnished studios, 1 bedroom and 2 bedroom condominiums. Each condominium has been individually designed with quality fittings such as granite benchtops, European kitchen appliances, private balconies and feature internet connection, video intercom, flat screen TV and DVD player, Italian designer tapwear and fittings, ducted air-conditioning, luxury furniture, high ceilings and much more. Location Address: 107A Sofia Street, Josefa Subdivision, Malabanias, Angeles City.